1. Is it possible for more than one organiser to access the event details, not necessarily to change anything, but just to view (monitor number of entries received etc.)? 2. Can I enter different event distances for different age categories? 3. Can I close for entries by age category? 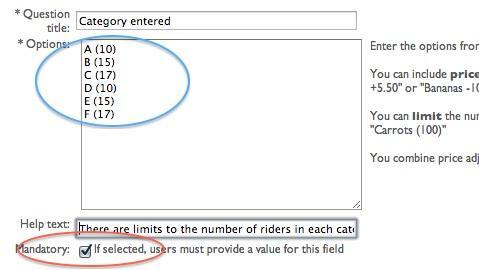 For example, if the A/B category race is full, can I close for entries from those age categories only? Yes to both - on first listing your event put something like '20-100km' in the 'distance' box. Then, later click 'edit settings' and on the 'Entries & fees' tab click 'Add entrylist' (circled below) for each category. Put the name and distance (e.g. 'A/B 100km' in the 'name field - so you end up with something like the picture below. 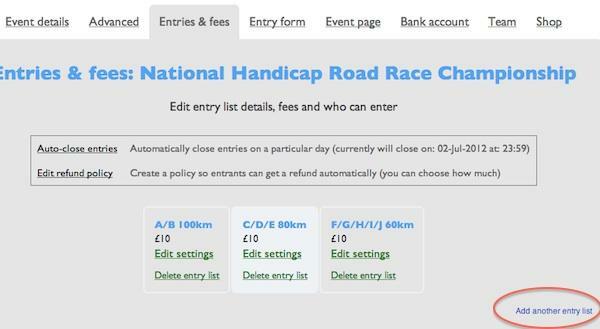 You can manage entry counts and so on separately for each category. 4. After the closing date, if the event is oversubscribed, can I decline and refund some entries? And similar for the second race for DEFG riders.? Tick 'Mandatory' (red circle) so entrants have to select one of the categories, this means the number of remaining spaces will be reduced each time someone enters. Put the number of spaces for each category in brackets next to the category name (circled blue). You can edit these numbers later if you need to. 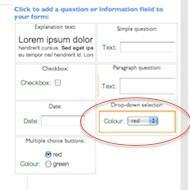 In 'Help text' explain the need to select a category and that there are limited spaces in each category. That should be it, now when 10 'A' riders have entered, the 'A' category will disappear from the dropdown, so no further As will be accepted, likewise with the other categories.